Welcome Back to Gotham City: Zodiac Killer: "I am Most Definitely Not Ted Cruz"
Zodiac Killer: "I am Most Definitely Not Ted Cruz"
The mysterious Zodiac Killer who terrorized northern California in the late 60's to early 70's finally broke a more than four decades-long silence by proclaiming on social media that, "I am most definitely not Ted Cruz." The as yet captured serial killer took to his social media accounts to fiercely denounce the internet meme that the junior Senator from Texas and Donald Trump's chief rival for the Republican presidential nomination and the Zodiac are one because, he claims "it tarnishes the legacy of the Zodiac." Zodiac, who always begins his rants with, "This is the Zodiac speaking..." resents the Republican senator with being credited with the five confirmed murders and especially the 37 for which the Zodiac had claimed credit. "Seriously, Ted Cruz wasn't even born when I killed for the first time in Lake Berryessa in '68." As proof of his identity, Zodiac posted on his Instagram account a picture of a bloody piece of shirt alleged to have been worn by cabbie Paul Stine, a victim in 1969. "This is the Zodiac speaking: Seriously, do you think Ted Cruz would've had the smarts to kill even just five people without getting caught or to communicate with the police with a grid cipher that couldn't be cracked after decades?" On Twitter, he tweeted, "This the Zodiac tweeting: I only wanted to shoot a bus full of kids. A President Cruz would kill many more with cuts to public education." Earlier today, Heidi Cruz, the senator's wife of 15 years, supported the serial killer's assertions, saying to Yahoo News, "The liberal mainstream media ought to listen to the Zodiac more closely. 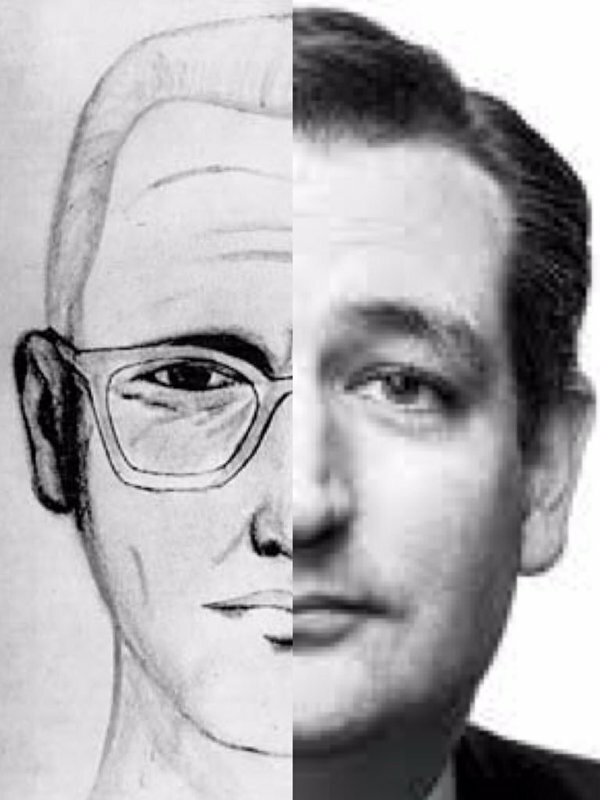 Despite the fact our daughter Caroline literally shivers with loathing and disgust at her father's touch and reechy kisses, my husband is not the most infamous serial killer of the 20th century and I wish this 24/7 news cycle would stop synonymizing Ted Cruz's name with the Zodiac killer. I repeat, Ted Cruz is not the Zodiac Killer." At press time, the Zodiac Killer still has not gotten a single follower on Twitter and has been suspended on Facebook for three weeks for not using his real name. Zodiac has vowed on his LinkdIn account to sue Mark Zuckerberg. Ha! Reminds me of the Church Of Satan people being Outraged! that Cruz is being compared to their lord and master.